This is a reluctant 4-star rating. AI Gigapixel’s blow-ups are sometimes jaw-dropping, sometimes just dodgy. It’s not magic, it’s a clever type of detail substitution we haven’t seen before. If you must use this kind of software, then this is perhaps the most convincing on most kinds of subject, and that’s probably all you can say about it. AI Gigapixel is a software interpolation tool designed to blow up photos that are too small into images large enough to print or display at larger sizes. You can do this using regular interpolation processes in Photoshop and other photo editors, but the results are not especially good, as Topaz Labs rightly claims, because you just get bigger, blurrier pictures. There are other software tools that do this, including ON1 Resize and Alien Skin Blow Up, and these concentrate mostly on preserving sharp edges in blow-ups, where regular interpolation algorithms tend to soften them. Sceptics will take claims about blow-up software with a pinch of salt. Once, people were taken in by magical elixirs of life, now it’s more likely to be perpetual motion machines or giant telephoto zooms for your smartphone that can see the moons of Jupiter. Or software that can restore missing detail in low-resolution images. Artificial Intelligence does seem to have become a byword for modern magic, a technological touchstone for folk looking for miracle cures. But look, a low-resolution image has a fixed amount of information. It doesn’t have any latent, hidden data waiting for a super-smart algorithm to bring out. The information that’s there is the only information there is. That’s just physics. In fairness to AI Gigapixel, what it does is actually slightly different. Note that it ‘recreates’ missing details using AI image analysis. It does not say that it recovers them from the original image. Amateur photographers and novices might be amazed at how AI Gigapixel can rescue their dodgy low-res images, but experts and serious photographers aren’t likely to be in this position in the first place, or as easily impressed by its results. The software itself is really very simple. It’s a standalone program where you add the image or images you want to resize to the main window and then choose the resizing options via a panel on the right. There’s nothing to learn. You load the image(s) you want to process, click and couple of buttons and go. You can enlarge images by scale as a percentage – it goes up to an impressive 600% – or by specifying new pixel dimensions. You can also change the level of noise and blur reduction from Moderate to None or Strong. And that’s it. The remaining options are for selecting the output file type, name and new location. 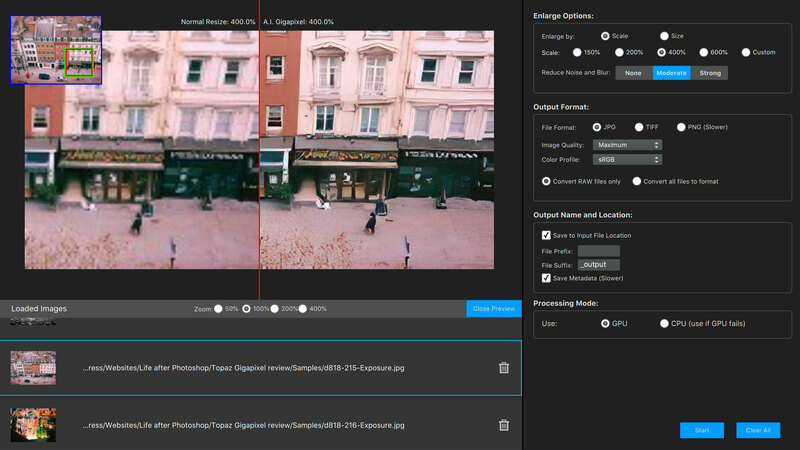 You can process images individually or add them to a batch processing list and just leave AI Gigapixel to get on with it. You can also use a preview window to take a closer look at its output before you process the image. If it’s nothing else, AI Gigapixel is super-easy to use. At first glance, the blow-ups produced by Topaz Labs AI Gigapixel are jaw-dropping. How is this level of detail, this level of clarity even possible? Even sceptics will be amazed at what this program can do… for a while. Well that’s pretty amazing. AI Gigapixel has reconstructed grass, fur and tree bark in the 400% enlargement (right) of our blurry original (left). You can click this image and those that follow to see a full size version. Oh, but wait a minute. If we pan to the left we see that AI Gigapixel has decided not to bother with the branches and twigs in the background, even though it looks like there’s lots of texture there. Closer examination of the results, however, reveals that this program is only clever up to a point. Of course it can’t generate detail that wasn’t captured in the first place. What it actually does is to generate the kind of detail it thinks might have been there – and a lot of the time, it’s rather convincing. After trying it out on a dozen different subjects, a pattern started to emerge. AI Gigapixel works particularly well on natural, random textures like grass, foliage, animal fur, the textures in stone and wood and other natural surfaces. Now and again it fudges detail instead of enhancing it, but with most natural, textured subjects it’s likely you will be quite amazed by the appearance of detail in its enlargements. It really does generate a level of ‘detail’ that you don’t get with other upsizing programs . That’s an amazing bit of texture reconstruction in the stone bollard and grass in this 400% enlargement. But what’s happened to the windows in the country house in the background? They definitely weren’t built crooked like this. With man-made subjects things take a different turn. For a start, AI Gigapixel cannot recreate licence plates from tiny blurred originals, CSI style, and this applies to traffic signs, store signs and text in general. If you can’t read the text in the original, neither can AI Gigapixel. Instead, it produces what looks like a myriad of tiny, sharply defined irregular polygonal regions that look convincing if you’re enlarging the random textures of grass, foliage or natural surfaces, but not so much with buildings, windows, straight edges in general and even human features. Have you used the Prisma photo-editing app? It’s a bit like that in close-up. AI Gigapixel works really well on this river scene, which is dominated by fine, textured detail. But can we read the license plate on the back of this flatbed truck? No. It’s just as unreadable but sharper. Finely-detailed windows in distant buildings can turn wonky after AI Gigapixel’s artificial intelligence algorithms have worked them over – sharp, but wonky – and distant human faces can take on a filled-in cartoon effect. Even full frame portrait shots don’t always work out well, as our example below shows. Ouch! Our model’s dress, skin and features have come out well, but her teeth DO NOT look like that! • These tests were carried out on images measuring 640 pixels on the longest edge, some on images measuring 320 pixels. This seems to be the kind of resolution most folk would be trying to upsize from. It’s possible that different resolutions and different enlargement ratios would produce different variations on the outcome, but the number of possible permutations is too huge to test here. You can download the software and use it for a month in trial mode to test it on your own images. Topaz Labs AI Gigapixel can do a remarkable job of creating the impression of detail and sharpness in images enlarged by crazy amounts. AI Gigapixel can render the right kind of subject with amazing clarity, but stumbles over text and other small man-made details. However, this is a best-case scenario with the right kind of subjects. It works well with natural, random, textures where it’s easy to accept the software’s best guess at what the details probably looked like. It’s a lot less effective on human faces and on man-made subjects where its tiny squirly polygons can start to look quite artificial. Sharp, but artificial. Even so, it feels like its clever AI-based detail regeneration is one step ahead of what its rivals can achieve, so on that basis alone it justifies a four-star review. It’s just annoying that Topaz Labs’ pitch promises or implies more than this software actually delivers.